After saving the product you can click on "Show deactivated products " to view all activated and deactivated products. You can later activate a product from the Actions dropdown list. If you create a Fixed Term product, you will have a Fixed interest rate. This allows you to accurately predict your future payments. On the other hand, if you choose the Dynamic Term type, the interest rate will be calculated dynamically. An Interest-Free Loan product is also an option if you do not wish to charge interest at all. The Tranched Loan product type allows disbursing a loan over multiple tranches instead of entirely up-front. For instance, if a loan is approved for $5000, the user may disburse $2000 now and $3000 later a two-tranched loan. A Revolving Credit product type allows multiple disbursements and repayments on the account. It has a payment plan associated with it, in which some amount of principal and interest may be paid. An Offset Loan product is a dynamic one which allows redraw facility to be enabled on it, and a borrower to borrow money they've already repaid. You can read more about it here. You can change this pattern to any other sequence of numbers and letters you wish. To setup a random pattern select the option from the menu > use a sequence of @ and # to define your pattern. The amount limits set here will define the constraints applicable when a user creates a new loan account in this product. Only loan amounts that fall within the minimum/ maximum range defined at product level will be accepted for client loan accounts. 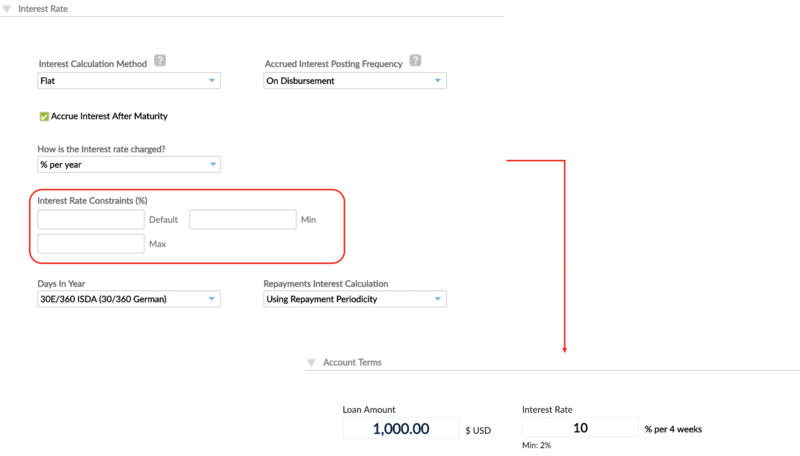 The "Default Amount " is the loan amount populated by default whenever a user creates a new loan account; the field can be left empty. For Tranched Loan product type you can specify if the loan amount can be disbursed in multiple tranches. You can choose one of three methods available - Fixed Flat, Declining Balance, and Declining Balance with Equal Instalments. Fore more datails on each method, please check the article Interest Calculation Methods in Loans. On Disbursement: All loan interest is applied as soon as the loan is disbursed, and booked as income at that point. On Repayment: Interest is applied for each instalment on the instalment's due date. To set the interest rate for the new product, select how it is charged and enter the default, minimum and maximum values . On Disbursement - all due interest (for the total duration and amount of the loan) will be accrued and applied in the account upfront on the disbursement date. On Repayment - interest will be applied in the account on the instalment's due date. Depending on your internal practices, you can choose to calculate interest over 365 or 360 days in a year. Given that interest accrues daily during a loan's lifetime, the interest due for any loan depends on the number of days in the month and is determined by the difference of days between the last repayment and the current one. There can be ocassions on which the days between instalments can differ from a regular schedule, for instance when there are more (or less) days between disbursement and the first repayment than for the other instalments, or when an instalment's date is moved because of a holiday. Here you can choose whether you would like to consider the real number of days when calculating the interest for the instalment, or if all instalments should have the same interest regardless the number of days of each instalment. Although this is 19 days away from disbursement, if you don't want the interest calculation to consider the first repayment duration, you should use the option Using Repayment Periodicity. In that case it will be calculated as though it's just two weeks (14 days) interest like all other repayments. With this setting, every instalment will be calculated with the same amount of interest, regardless of the real days that have passed. If you were to use Actual Number of Days instead, then the interest would be calculated based on the real number of days between December 1 and December 20 -- 19 days worth of interest. This setting would also modify all other instalments that have a different number of days than usual because of holidays. 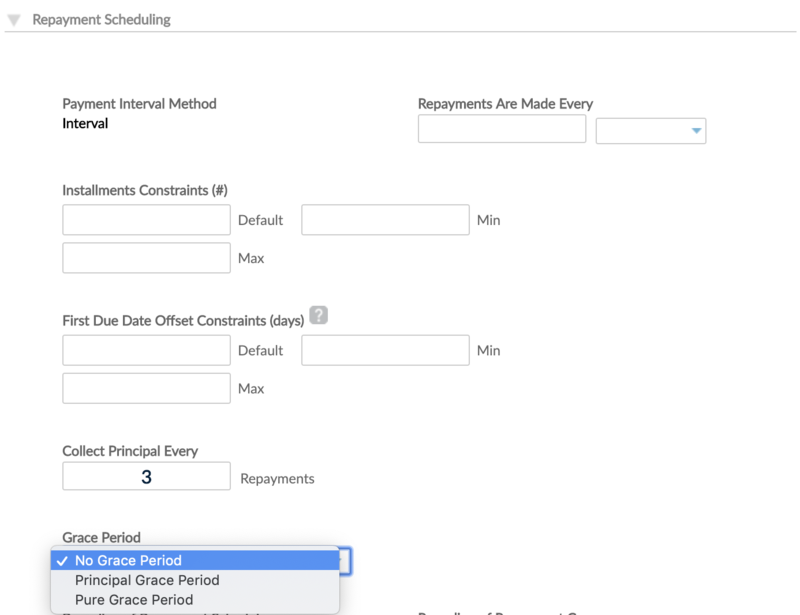 If you choose the Dynamic method for schedule calculation, the Accrued Interest Posting Frequency will automatically be set to “On Repayment”. This results from a possibility in Dynamic method to recalculate the interest during the life of the loan. For products using the Dynamic method, you can choose Interval or Fixed Days of Month. 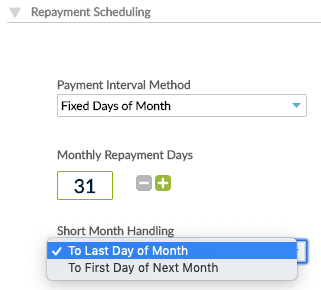 Choose Interval to specify that payments should be made after certain periods of time - monthly, weekly, etc. 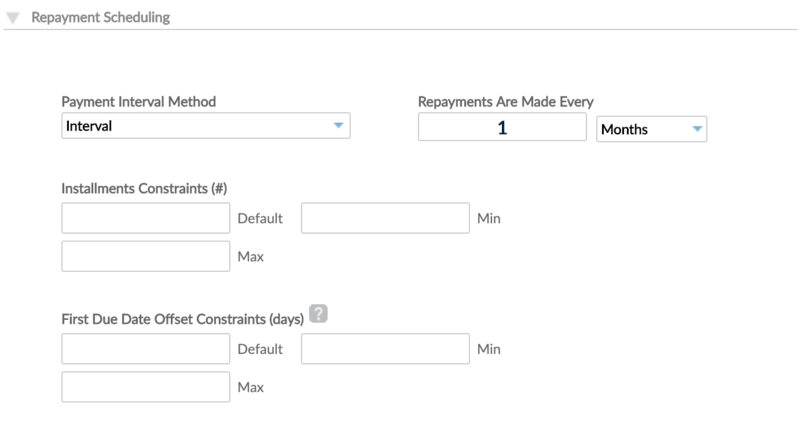 You can then further customize the repayment frequency and constraints for offsetting the first due date. To define the number of instalments, enter the default, minimum and maximum values in the appropriate fields. 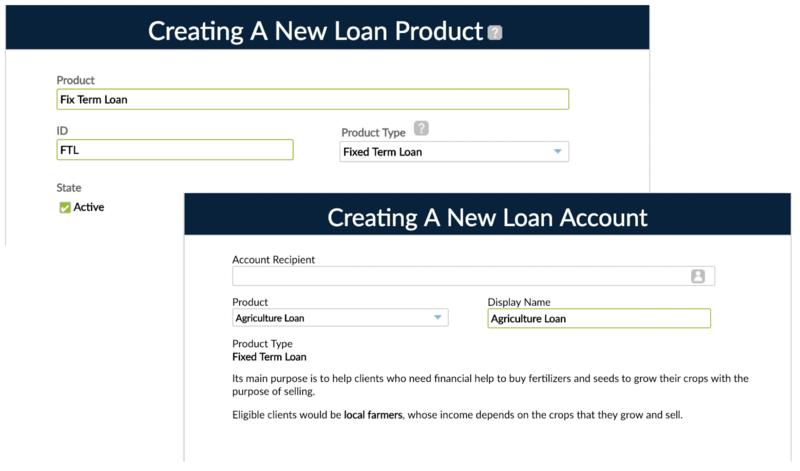 If you want a more flexible product that allows you to select any repayment frequency when creating a loan account, leave this section blank. Choose this option if repayments should always fall on specific days of the month, such as always on the 1st and 15th of every month. This option is commonly used for payday loans, for instance. If the Fixed Days of the Month option is set to have payments due on the 29th, 30th, or 31st day of the month, Short Month Handing will "move" the instalment when the month has fewer days. The system will create the instalment for that month to be due to either last day of the month (e.g. 28th) or the first day of the next month – depending on your choice. If you use this methodology, you can set the principal collection frequency by entering the number of instalments for which there should be no principal collection. Principal Grace Period, will determine that clients will only pay interest for the duration of the grace period. Pure Grace Period , determines that the client won't pay interest or principal for the duration of the period. If you choose No Rounding , when there is a discrepancy between the loan amount to be disbursed and the total balance after rounding, Mambu will show you a warning message asking you to either adjust the loan amount or the number of instalments. So, suppose you create a loan of $1000 with 3 instalments. This would result in a repayment schedule with instalments of $333.33 which would sum a total of $999.99 instead of $1000. If you choose No Rounding decimals will be left as they are. However you can choose Round up to Nearest Whole Unit so for instance 62.2 becomes 63, and Round to Nearest Whole Unit, which will work similar but 62.2 would become 62 and 62.5 would become 63. 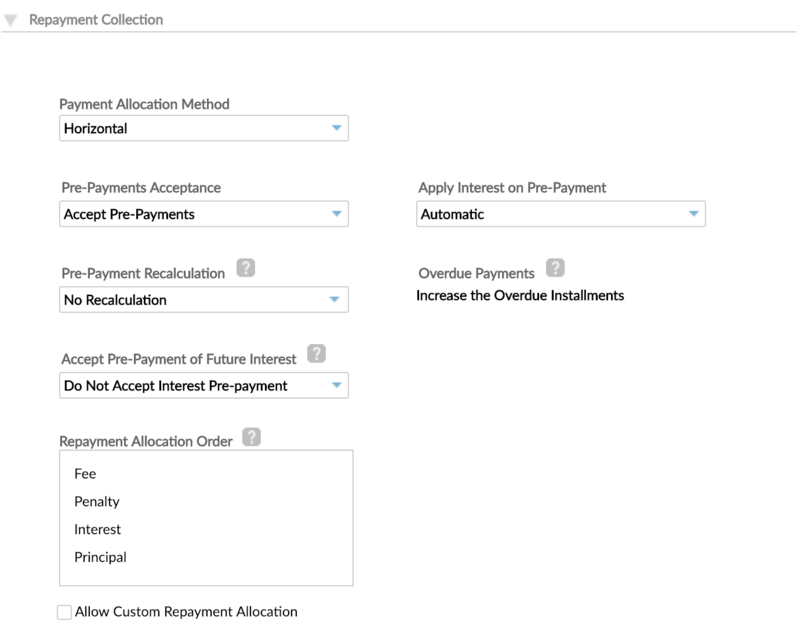 When a repayment is entered for an account using Horizontal Payments it's the actual repayment schedule that will determine what should be paid first based on the due dates. The amount entered will always be used to pay each instalment and only move to the next instalment due, when the previous has been completely paid. Accounts using Vertical Payments will be paid based on the account balances of principal, interest, fees and penalties, following the allocation order defined in the product. Payments are allocated based on the type of outstanding balance (interest, principal, etc) regardless of the repayment schedule. The Vertical Payments option is only available for the Dynamic schedule calculation method. Please see Horizontal+vs+Vertical+Payment+Allocation.xlsx for examples of each payment allocation method. Some organizations would like to allow their customers to pay in advance also the interest that is not due yet for upcoming instalments. The setting Overdue Payments is usually set to Increase Overdue Instalments. However, for a particular configuration (that is if you select Reduce Number of Instalments for Pre-Payment Recalculation) you can chose Increase Last Instalment. To illustrate the explanations above see below for two identical loan accounts, one with Increase Overdue Instalments, the other with Increase Last Instalment. The loans were backdated so that there are late instalments. The repayment made shows how the late or last instalments were affected. Only transfer full dues - allows only transfers of the total amount due - the transfer of funds will only be performed if there are enough funds on the deposit account to cover all the instalment due, otherwise nothing will happen. Allow partial transfers - even if the funds on the deposit account are not enough to cover all the instalment due, the transfer will still happen. No automated transfers - allows auto-creating linking loans to settlement deposit accounts, but doesn’t perform automated transfers. Inclusive taxes, will be already included and calculated for any interest/fee/penalty income. For example, a 10% inclusive tax rate on an interest income of $100 will result in $10 included as VAT, the total charged to the customer would be $100 ($90 interest, $10 taxes). Exclusive taxes, are calculated on top of the stated interest/fee/penalty amount. For example, a 10% exclusive tax rate on an interest income of $100 will result in $10 as VAT, which will be added on top of the $100 interest, meaning a total charge of $110 ($100 interest, $10 taxes).